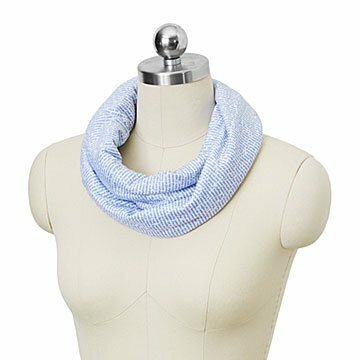 Get wrapped up in a good book with one of these 5 classic novel scarves. This scarf may look like just a cheerful pastel accessory from afar, but get close and you may find yourself in the middle of an 18th century love affair, or attending an infamous party at Nick Carraway's. Printed on feather-light, spun polyester—a special technique for acute readability—this literary scarf features approximately 30,000 words from your choice of Pride and Prejudice, Outlander, Anne of Green Gables, The Great Gatsby, or The Princess Bride. The silky scarf embellishes any outfit without adding bulk, making it a top-notch accessory for the warmer seasons of your personal narrative. Made in Massachusetts. I wrap it three times for a snug turtleneck. And once when I forgot my hat on a walk I wrapped it once around my head and ears, and then twice around my neck, and was toasty for the entire walk. While it's a wonderful idea, I felt the script could have been prettier and the colors bolder. I think my friend liked it due to the premise but I was a bit disappointed in its design. My wife has worn the scarf as the weather is getting chillier in autumn. I love the Outlander scarf. It is one of my favorite books and I would buy this text pattern in pillows, blankets, gloves, EVERYTHING. It's super soft and the color is perfect for my style. No negatives, however if these scarves were cheaper, I would buy one of each. Anne of Green Gables is one of my favorite books, and it's so fun to wear the text! This scarf is beautiful and soft, and I get compliments whenever I wear it. I love everything about this scarf - the size is perfect (it lays against my neck without feeling tight), the material is comfortable, and it's fun to have a functional accessory that's also one of my favorite literary works (Pride and Prejudice).